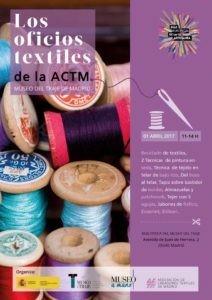 During the past few months I have done a number of ‘felted soaps’ workshops in different venues -including El Corte Inglés department store- and I have just done a demonstration in the Museo del Traje (Costume Museum) in Madrid, as part of the European Crafts Days programme. It was great to see how much expectation my soaps continue to generate. When people hear the words ‘felt’ and ‘soap’ together, their first reaction tends to be one of surprise and curiosity. But, when they see my designs, they discover what a felted soap is, how it’s made and its properties, they realise that it’s a great idea to put those two elements together. 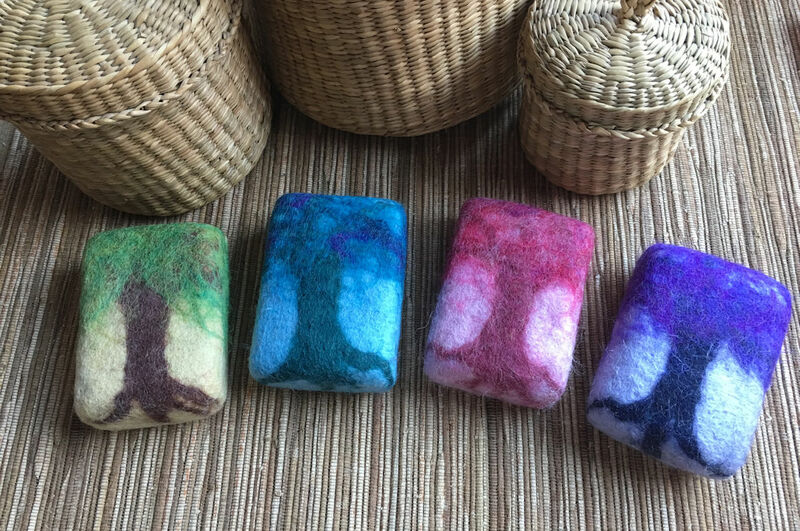 Whether they are interested in felted soaps simply for the pleasure of having them at home and using them, to make an original gift, or because they want to learn to make them themselves as a craft project, there are certain questions I get asked often. I’m going to try to answer them here. First frequent question: Are felted soaps just an ornament or can I use them? Many people tell me that they are so beautiful, such a lovely ornament, that they feel they shouldn’t use them up, but they are soaps and you can of course use them for your personal hygiene: in the bath, shower or to wash your hands. I use natural high quality olive oil base soaps -and some with added essences- to create my Suhzo felted soaps. I then cover these soaps with a felt ‘sponge’ with an original design. Olive oil is highly moisturising and a natural antioxidant rich in vitamin E. The hand-felted sponge I cover the soap with is made of merino wool, a natural fibre with anti-bacterial and anti-fungal properties. It is also gently exfoliating and it improves circulation. It also protects the soap, making it last longer. In summary, a felted soap provides a really luxurious skin cleansing and toning experience. Second frequent question: What happens to the felt sponge when as soap is used up? When you use the soap, the felt sponge shrinks little by little at the same time as the soap. When the soap has been fully used up, you are left with a little hollow pouch which you can transform into a brooch or pendant, fill it with lavender or with a few drops of essential oil to use as a freshener inside wardrobes or drawers, or even continue to use it as a little exfoliating sponge. Third frequent question: How long do the felted soaps last? The soaps I use for felting weigh between 100 and 125 grams and they last approximately a month when used daily or frequently. Fourth frequent question: Do the colours of the felt run? When people see the intense bright colours of the felt designs, they often think they are painted on and ask if they will run with the soap and water. The designs I make on my soaps are not painted. They are created with merino wool pre-died with colours which are resistant to light, water and soap. It is a special wool for wet felting, which is done -as the name indicates- with water. Therefore, the colours should not run. Fifth frequent question: Can the soaps be left to dry in the sun? It is not convenient to leave them to dry in the sun, because the direct sunlight may fade the colours. Sixth frequent question: Are they difficult to make, or can anybody learn to make them? Can children make them? 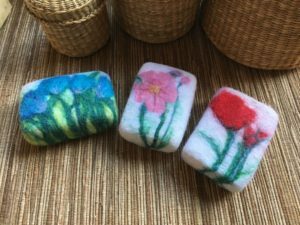 It’s not difficult to make a felted soap and children from ages 8 or 10 and up can -of course- make them. I have done various workshops with children. They love making them, choosing their favourite colours, rubbing their soap, and they feel super-proud of themselves when they can take something home that they can then use to wash with every day. The basic technique consists on ‘felting’ the wool around the soap. This is done by transforming the fibres into felt, which is achieved with water, heat, soap and pressure. Anybody can learn to felt a soap in a few hours during one of my workshops, although the more intricate designs of my soaps require more advanced techniques and would need more learning and practice time. I will soon create a tutorial explaining how to make felted soaps. Please, subscribe to my list on www.suhzo.com if you want to receive it.